As a German shell bursts dangerously close by, steady veterans of the 4th Indian Division continue to move forward across a stark desert landscape. General Alexander inspects the 3/2nd Punjab. Late that night, two lieutenants, escaping the fug of the VCOs’ circle, prowled the tented rows of Latifiya Camp and found a pipeline on which to sit, or perhaps lie down. They lay down. The stars hung chandelier-like, so infinitely various and bright that some seemed pinned up, high in the tent of night, and others dangled low, heavy with radiance. Bobby’s head spun slowly, and he could not shut his eyes, and the stars poured into them. In the desert, Wright said, this was the only sight he had not tired of ten times over. On his first night at Ruweisat Ridge, he thought God had taken down the old night-roof and put in a new one. The sky had three dimensions here, which was a mercy, because the desert was so damned flat. They were engineers, trained to work with inclines, gradients, cambers, but in the Western Desert, just about the only place where vertical relief mattered was up there. The stars suggested it, and men elaborated on the imaginary contours. The launch and drop of artillery shells traced thousands of hills in the sky; the long flight of Spitfires and Stukas drew an aerial steppe. Paratroopers jogged down gentle bluffs, swinging sideways from slope to opposing slope. Bursting anti-aircraft shells made pale vegetation, and even shots from rifles, fired in error or in desperation, added the thinnest pencil strokes to the mad conjured landscape. In night battle it was visible: Verey flares etched the luminous outlines, which glowed in his eyelids when he blinked. Mainly there was no battle. Only the desert, so woefully flat. 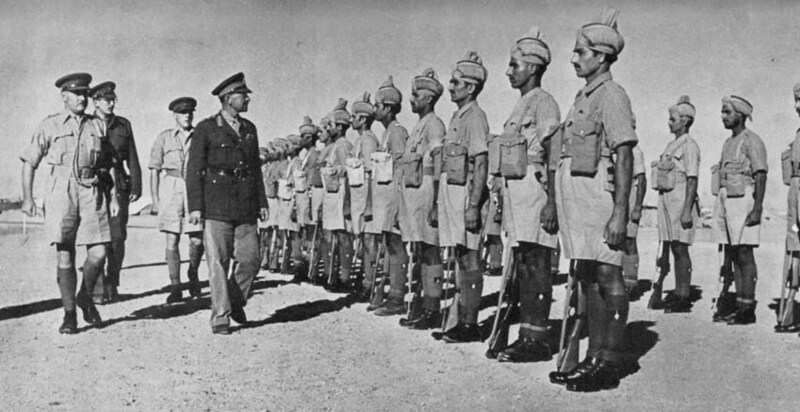 Wright arrived in Cairo to the news that his formation, the 3rd Indian Motor Brigade, had been destroyed at Gazala. He was instead to join 2nd Field Company, barely half a mile from the front line. On Ruweisat Ridge rain had parted the curtains of desert haze, and a long blue scratch of Mediterranean water had appeared to the north, beyond the pebbled flatness. The infantry roasted in their trenches, endlessly cleaning the sand out of their weapons and flies out of their ears. In the daytime, an inattentive nomad might walk right through the forward area, veined and scabbed as it was by trenches and sandbags, and barely notice. Brown heads and helmets only rose out of the earth like moles, travelled low along the ground and vanished again. Only the engineers worked all day, fixing desert tracks or blasting rock, or planting and clearing, planting and clearing, planting and clearing mines. At dusk, as the sky’s fever abated and cool winds crossed the camp, life rose out of the blistered ground. Bright points of cigarettes glowed against the indigo sky and the grey earth, and the Muslim sappers bent in prayer, their bottoms to the foe. Cut-off petrol tins mouthed cowbell noises as tea was boiled. Infantry patrols slipped up to the wire, and rifles barked as snipers took aim at silhouettes, in the minutes before they were swallowed by darkness. It was not until September that the dreary peace lifted, and a battle began that dazzled the eye. Replaying Gazala, the Panzers punched into the southern El Alamein front, then swerved back in behind the British lines, cutting an arc below Ruweisat Ridge. From up on top, Wright watched the fireworks. If it had been scored by Wagner instead of the machines, it would have seemed a war of angels. To the south, above the main enemy thrust, Fairey Albacores dropped phosphorus flares that lit up the desert with electric brilliance, illuminating targets for Wellington bombers. Above their own sector, the Luftwaffe slit the full-moon sky with tracer fire. Planes dropped cases of butterfly bombs: delicate contraptions with hinged casings that sprang open, releasing a pair of wings that spun in the airflow, and drove a spindle into the bomblet to arm it. Landing, they flashed complex patterns on distant ground. Pulsing scarlet flares arced above the Allied lines, and searchlights swung across the spectacle, long flailing spider legs of light that grabbed at the descending figures. The stars burned on above it all. ‘An exhilarating performance,’ the major wrote in the unit diary. The following morning they had orders to move east at once, and lay a minefield to stop the Panzer force from getting any further north. The company’s lorries stretched out into the desert, each a hundred yards behind the other, raising a great cliffside of dust and grit. Wright, in charge of picking up stragglers, drove a jeep all the way at the rear. His windscreen wipers worked non-stop to scrape open a view of the road. Turning to look over his elbow, Wright noticed a stationary staff car just south of their line of march. It didn’t seem to belong to the company, but he pulled off the track toward it. He stopped a regulation distance away and hailed the men beside the vehicle, and hearing English voices, walked over. The Humber had its bonnet up, and a helpless-looking sergeant underneath it, prodding at an engine that was belching steam. By the doors were two older officers, one carrying a fly-whisk and wearing the beret of the 11th Hussars, and the other wearing a flinty expression and a peaked cap with a red band. ‘Anything wrong, sir?’ Wright called out. Wright brought his jeep up to where the staff car was still sizzling. The fan belt was gone. Wright made sure his face stayed flat and solicitous. The Eighth Army Commander was General Auchinleck, but this didn’t look like him. Someone had neglected to tell him that ‘the Auk’ had been relieved of his command. The news would be disappointing to any Indian soldier, but especially for the 161st Brigade, which included the regiment the Auk had once personally commanded, the 1/1st Punjab. ‘Oh!’ said Wright, and saluted again. He hooked up the Army Commander’s car and off they went. Wright’s eye drifted to his rear-view mirror for a glimpse of the pinched face of the man who would dictate the fate of the Eighth Army. He was General Bernard Montgomery, the second appointee to replace the Auk, after a German Stuka put a bullet in the chest of General Gott as he flew to Cairo. Montgomery had some antipathy for the Indian Army: perhaps because he hadn’t passed out from Sandhurst high enough to join it himself. Wright was thinking that it would require snappy navigation to get the general to the Army HQ and still locate his convoy before dark. He decided to head straight across on the compass bearing, which meant getting off the main Army track. He quickly found a strategic track, less visible and used by L-of-C transport to evade aerial observation, and steered onto it. It was rough and covered in fine sand, but the coupled vehicles made good progress. Wright’s eye went to his mirror again. The tow-chain disappeared into a cloud of dust. He sighed. Eventually he deposited a beige-masked, sand-blasted Army Commander at Burg el Arab, and waited for thanks, ‘which were not forthcoming’. Hours later, when he found the company, he also found a furious captain waiting, who refused to believe a word of it. When Bobby’s duties had him in the HQ tent, he read through the onion-paper pages of the unit diary, as quick as he could. The story of the September battle was completed here. By the time the sappers’ work on the new minefield had begun, Rommel’s last thrust was already exhausted. Short of petrol again, his Panzers ground to a halt amidst the fighting. They were forced to withdraw, and the offensive chance now lay with the Eighth Army, which was flush with new troops, new American tanks, raised morale and plenty of fuel. The 4th and 5th Indian Divisions traded places one final time. The weary 5th piled into lorries to join the enormous reserve lying up in Iraq; only the 161st Brigade, its battalions still fresh, stayed put on Ruweisat Ridge. In the unit diary Bobby found the letters that had come down to the company in October, announcing ‘D-Day’ at last. ‘Together we will hit the enemy for a “six”, right out of North Africa,’ Montgomery wrote. ‘Let every officer and man enter the battle with the determination to do his duty so long as he has breath in his body. AND LET NO MAN SURRENDER AS LONG AS HE IS UNWOUNDED AND CAN FIGHT.’ The 4th Division commander had added his own message: they were to fight to ‘the last man, the last round, the last bomb, the last bayonet’. It never came to that – Wright resumed his story, while they checked a register of tools maintenance with the stores naik that evening – once the attack began, Rommel’s ranks were quickly broken. There was one terrible day when a Stuka bomber dropped a stick of bombs over their lines, nearly killing the officers in the mess truck, but saving its rage for the cook staff. They found the water carrier, Maqbool, screaming at a stump of flesh that had been his left hand. Mohammed Sharif the masalchi, only seventeen years old, was blown to pieces, ‘shattered from head to toe’; Budhu Masi, the cook, was disembowelled. He was twenty years old and healthy. He took three hours to die. Still the battle moved west of them, and its blanket of noise was lifted, then blown off by the open roar of the wind. 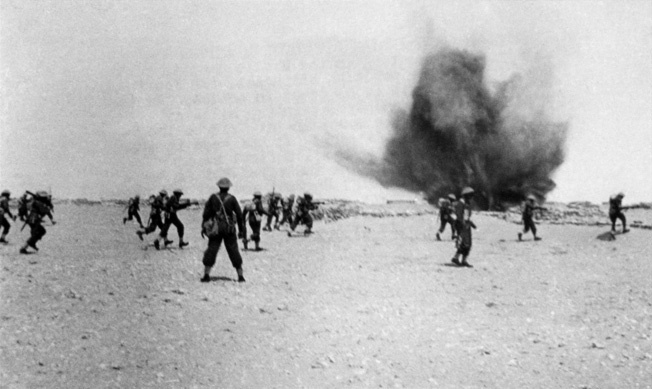 Wright’s platoon found themselves in a quiet sector by the Qattara track, clearing S-mines. Those were anti-personnel devices that popped into the air and exploded at chest level. It was while clearing a minefield that the sappers looked like the farm boys many of them had been. A serried line of men jabbed their bayonets into the ground and felt for the edge of metal on metal. If they felt nothing, they struck again and again, clearing crescents before them, and advanced this way, scything slowly under the sand. The strange agriculture of the desert. One side planted steel seeds, and the other side harvested them. Only some lived out their natural design, to rise suddenly as a plumed palm of shocked air and sand. Wright sat on a rock, watching his men till the sand. One NCO, Naik Taj Mohammed, was moving fast – he had cleared about thirty already. But then: the sharp noise, the bomblet hanging in the air. Wright felt the blast, the instant of utter surrender, everything tilting over, followed by long, gaping seconds of realisation. He saw the naik sit upright, his belly hanging in his lap like a tongue. It was bad but he would survive; the Germans built the mines that way, since a wounded man was a heavier burden than a corpse. When the ambulance left, work resumed. Afterward, a jeep rolled up to where Wright stood, and he was hailed by Colonel John Blundell, the divisional Chief of Royal Engineers. The lieutenant explained how things were going. ‘Right, well, hop in,’ said the colonel. ‘They can look after themselves.’ They drove west into a minor depression of soft sand, interrupted by great limestone boulders, outrageously sculpted by the grainy wind. Wright was chuffed to be so friendly with the colonel, the CRE, and they spoke idly about the news of the fighting. The Desert Fox was losing, for lack of the one thing he valued even over water: petrol. This time the Eighth Army could exploit its advantage all the way. Both men were offended that the 4th Indian Division, one of three Allied divisions in Egypt since the desert war began, was being held back on salvage duty. Wright was wondering aloud whether that had anything to do with him giving Montgomery a mouthful of sand, when he heard a snap and a whistle past his ear. It took a moment to register that they were being shot at. His instinct was to duck behind the dashboard, but the colonel floored the accelerator, and the jeep lurched forward at one of the boulders. Sure enough, an Italian soldier emerged from behind it with his hands behind his head. ‘Know Italian?’ the colonel shouted, above the engine’s whine. Wright didn’t. The jeep slammed to a halt in front of the Italian, and the colonel leapt out and bounded right at him. In a flash, he picked up the man’s rifle and tossed it as far as he could. Then he gripped the straggler by his shoulders, and in lieu of arresting him as a prisoner of war, the colonel turned him to face due east, stepped three paces back and gave him a running kick in the bottom. The Italian went sprawling in the sand. The colonel dragged him back to his feet, turned him east again and gave him a shove. The Italian took off running toward the Eighth Army reserve. John Wright watched as the soldier pitched through the sand. His figure grew smaller and lost detail, but on the clear, flat ground he stayed visible for a long while, running east and east while his army ran west. Very soon, Wright suspected, he would be doing the same. This entry was posted in India, Personnel by MSW. Bookmark the permalink.